I have already found a Bakery that sells great Bread just up the hill from the Wanza Hotel here in Addis, Ababa, Ethiopia. I seem to awake earlier than the staff or guards and had to wake them to leave the Hotel, so I decided to sit out in front of the Hotel and watch the world pass by eating my bread of course before waking the guards again to enter the Hotel. Just before I was about to stand up and walk into the Hotel this kid suddenly was at my feet, therefore what the hell, I took a photo. 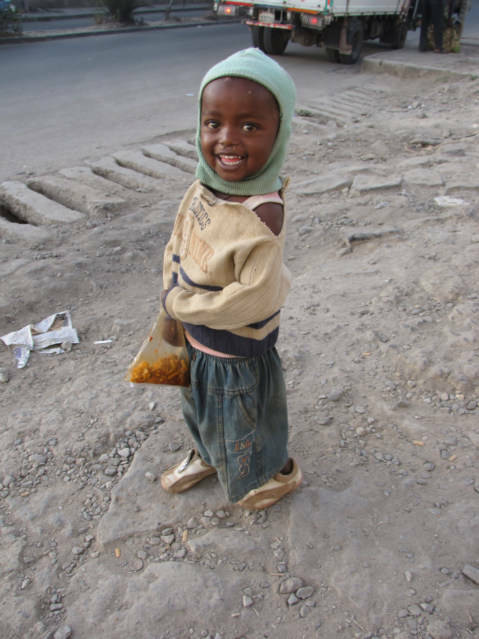 I do not think the Kid has anything to do with the Beggar; he just sat down to watch. 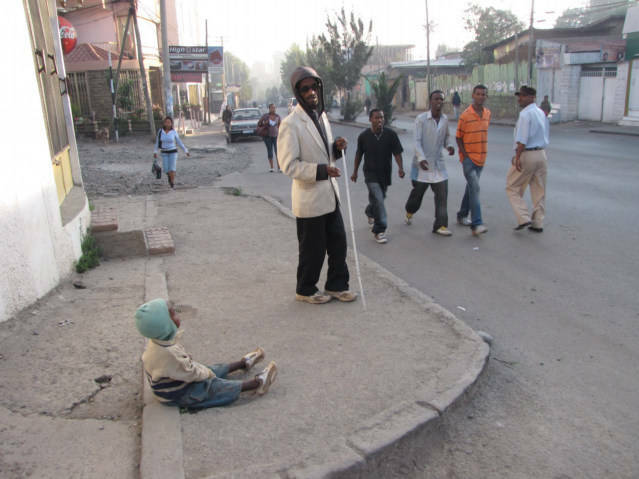 The kid was able to sneak up on me because I was watching this Blind Beggar work his way down to the road and start begging. I was trying to be very quiet; I was hoping the Beggar could not see me. It is often strange, how can blind beggars know I am close? I took this photo and as he turned around, he suddenly recognized that I was there, hard to say, maybe one of the people walking by alerted him to my presence.